Slow motion clip of large grizzly bear walking through and searching murky water the walking off leaving frame. Grouse Mountain, British Columbia, Canada. Shot June 2015 on Panasonic GH4. hd00:08Coola, a large, beautiful, brown grizzly bear, sits and relaxes peacefully in the cool, calm waters of a pond. Filmed on Grouse Mountain in North Vancouver, Canada. 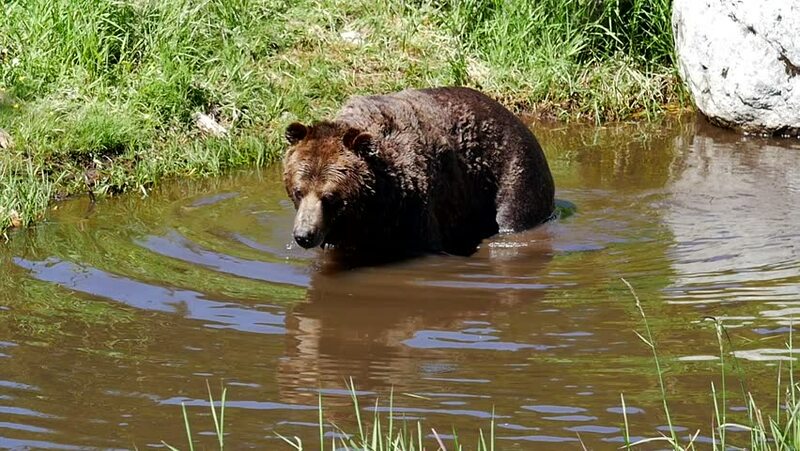 hd00:07Coola, a large, beautiful, brown grizzly bear, sits and relaxes peacefully in the cool, calm waters of a pond. Filmed on Grouse Mountain in North Vancouver, Canada. hd00:10Wild Hippo (Hippopotamus amphibius) wallows and feeds in the grass along Chobe River, Botswana, Africa. Strong jaws and teeth are seen. These are the most dangerous & territorial animals in Africa! hd00:16Two large, brown grizzly bears meet at the water's edge. One bear is perched atop a fallen log, looking down into the pond at the other, who sits submerged in the pond. The other bear walks away. hd00:31Coola, a large, beautiful, brown grizzly bear, sits and relaxes peacefully in the cool, calm waters of a pond. Filmed on Grouse Mountain in North Vancouver, Canada.